I was exhausted and fuzzy-brained all day today. Not sure what was going on, but I ended up taking it easy as a result. Now that I’m thinking about it, I wonder if I’m suffering a reaction to whatever was in our Chinese food on Thursday. I was pretty tired yesterday, as well. Maybe it’s the MSG, or a response to carb-overload with all the noodles I ate. Whatever it is, no matter what I’ve just got to push past it tomorrow and forge on ahead – no more sitting around, even if I do feel like I might fall down from exhaustion at any second. Speaking of which, I need to get some shuteye. 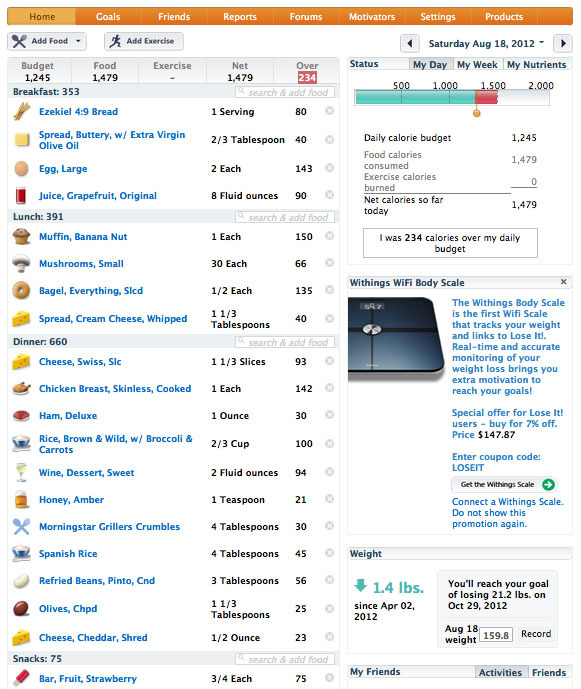 Here’s my LoseIt record for the day. Not too great, but overall not too bad, either.